There are seven planets orbiting a small dwarf star known as TRAPPIST-1. In 2016, three planets were discovered around the star, and today four more were announced. All of these worlds are roughly the size of Earth, and three are potentially habitable. On its own, TRAPPIST-1 would be easy to overlook. It’s a dim, 18th magnitude star, 40 light years away in the constellation of Aquarius. So what led astronomers to look for planets around this unassuming star, and how did they find them? TRAPPIST-1 is known as an ultra-cool dwarf star. It has only 8% the mass of our Sun, or about 84 times the mass of Jupiter. If it were much smaller it wouldn’t have enough mass to fuse hydrogen in its core, and would instead be a brown dwarf. Although it’s about 80 times more massive than Jupiter, it isn’t much larger than Jupiter. That’s because the star much more dense than a planet due to its gravitational weight. Although it is a star, it’s size makes it somewhat Jupiter-like. In some ways Jupiter can be seen as a miniature planetary system. Eight of its moons have nearly circular orbits, and four of them are the size of our Moon or larger. Other gas planets in our solar system have large moons in nearly circular orbits, so some astronomers speculated that a small star like TRAPPIST-1 might have Earth-sized planets orbiting close to the star. Although ultra-cool dwarf stars are dim and cool, a close planet might be warm enough to support liquid water on its surface. And unlike larger dwarf stars, ultra-cool dwarfs might lack large solar flares that would threaten the habitability of close planets. 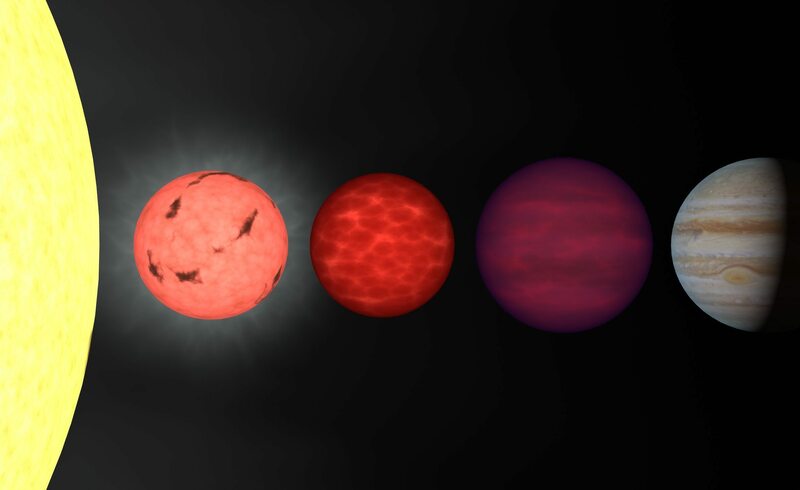 So a team of astronomers started looking for evidence of planets around small dwarf stars. Using the TRAPPIST–South (TRAnsiting Planets and PlanetesImals Small Telescope–South) telescope at ESO’s La Silla Observatory in Chile, they observed the changing brightness of stars like TRAPPIST-1, hoping to catch a planet as it passed in front of the star. This is known as the transit method of planetary detection, since the planet transits in front of the star from our vantage point. Animation showing the transit of a planet. Credit: NASA/Hubble. TRAPPIST-1 is so small and distant that we can’t see a planet transit directly, such as when Venus has transited the Sun. Even viewed with a telescope like TRAPPIST–South, the star looks like a point of light. But when a planet passes in front of the star, it blocks some of its light. We see this as a slight dimming of the star. It’s a simple method in principle, but in practice can be quite complicated. Transiting planets aren’t the only thing than can cause a star to dim. So can things such as starspots and other solar activity. There have been cases where what initially looked like a planet turned out to be a false positive. 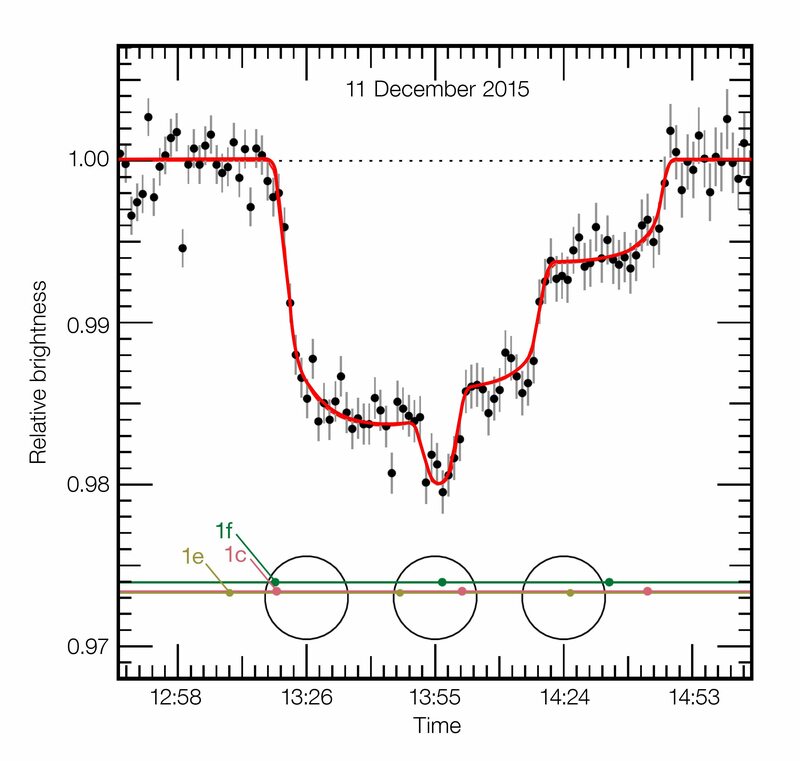 This plot shows the varying brightness of TRAPPIST-1 during an unusual triple transit event. Credit: ESO/M. Gillon et al. To make sure a dip in brightness is actually a planet, astronomers need to make multiple observations to ensure they follow a regular pattern. The more transits they observe, the more confident they can be that it really is a planet. That’s part of the reason only the three closest planets were announced last year, and the outer four planets were announced today. Although the only evidence for these planets is the dimming of TRAPPIST-1, there is still quite a bit we know about them. To begin with, the size of a planet determines the amount of dimming during a transit. Larger planets block more of the star, and there for the dip in brightness is larger. Knowing the size of TRAPPIST-1, the team could measure the transit dimming due to each planet to determine its size. This is how we know all seven planets are roughly the size of Earth. Some a bit larger, and some a bit smaller. We also have a good idea of their orbits. The time between transits tells us how long each planet takes to orbit the star, known as its orbital period. The orbital period of a planet depends upon the mass of its star and the planet’s distance from the star. Since we know the mass of TRAPPIST-1 reasonably well, we can calculate the distance of each planet. By measuring the length of each transit we can also get an idea of each planet’s speed. Since these speeds agree with the speed of a circular orbit, we know the orbits of these planets are fairly circular, just like planets in our solar system. It’s an amazing system, but could it be a habitable system? That’s a completely different question, and one that must be explored more cautiously. 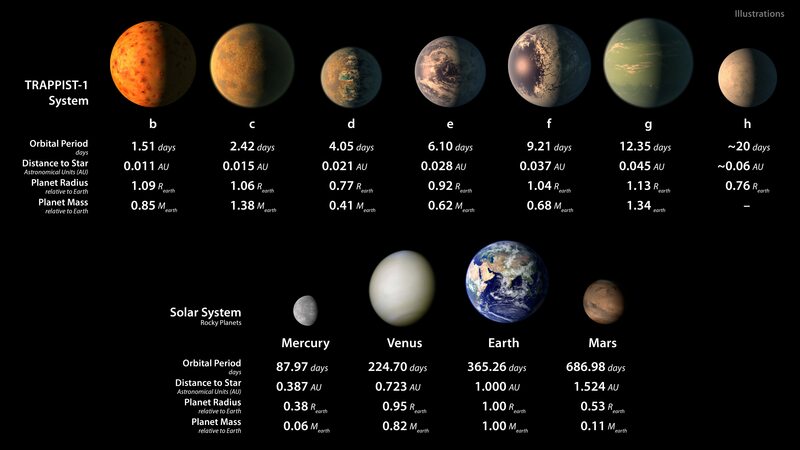 Three of these planets are at a potentially habitable distance, meaning that theoretically liquid water could exist on their surface. While we know the size of these planets is similar to Earth, we don’t know their mass. We also have no data on whether they have atmospheres, or if they are wet or dry. All of this affects their potential habitability. But even without this information we can make some educated guesses, given what we know about other planets and planetary systems. It’s a fascinating topic, and one you can read all about in a post by my colleague and astrophysicist Ethan Siegel.